Objectives: The aim of the study is to determine the effectiveness of ground based walking with relaxation techniques to improve the quality of life in patients with COPD. Methodology: Participants were randomized into two groups. In experimental group patients received ground based walking and relaxation techniques. In control group patients received only relaxation techniques .Pre test and post test evaluation is done using the Borg’s Scale and Clinical COPD Questionnaire. Results: There is significant improvement in patients with COPD who received ground based walking and relaxation techniques when compared with the patients received relaxation techniques alone. Conclusion: The present study proved that the both ground based walking and relaxation techniques are effective in improving the quality of life in patients with COPD than the relaxation techniques alone. Pulmonary rehabilitation is recognized as an essential component of the management of Chronic Obstructive Pulmonary Disease. Ground based walking is one such mode of training. Walking significantly improves walking capacity and quality of life for patients with COPD. In this patients underwent ground based walking with relaxation techniques under supervision. In this group patients underwent relaxation techniques such as breathing exercises and progressive muscle relaxation techniques. The following parameters were used to record the parameters. 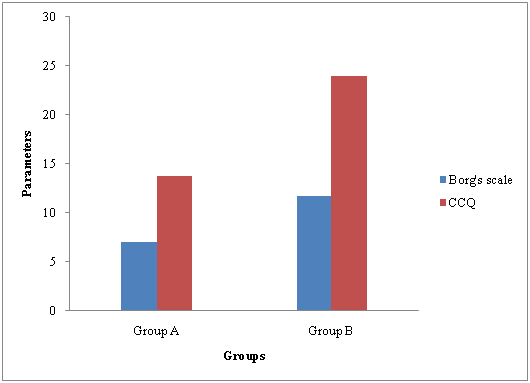 Independent “t” test was used to show the effectiveness of treatment between group A and group B (Graphs 1­–5). Graph 1 Borg’s Scale For Group A.
Graph 2 Borg’s Scale For Group B.
Graph 3 Clinical COPD questionnaire Group A.
Graph 4 Clinical COPD questionnaire Group B.
Graph 5 Mean difference between group a group b for borg’s scale and clinical COPD questionnaire. This is a comparative study in which the objective is to determine “The effectiveness of ground based walking with relaxation techniques to improve quality of life in patients with chronic obstructive pulmonary disease.” The purpose of study is that there is significant improvement in quality of life and reduction of anxiety level in patients with chronic obstructive pulmonary disease. In each group Borg’s scale and Clinical COPD Questionnaire (CCQ) are used. The Borg’s scale is used to identify the reduction of dyspnea level and CCQ is used to measure the health status in patients with chronic obstructive pulmonary disease (Table 1). Using Borg’s scale, in Group A there is maximum improvement in 2 patients, moderate improvement in 10 patients and minimum in 1 patient. 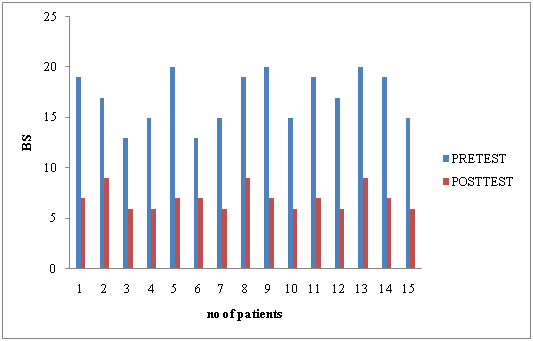 In Group B there is moderate improvement in 7 patients and moderate improvement in 6 patients and no improvement in 2 patients. 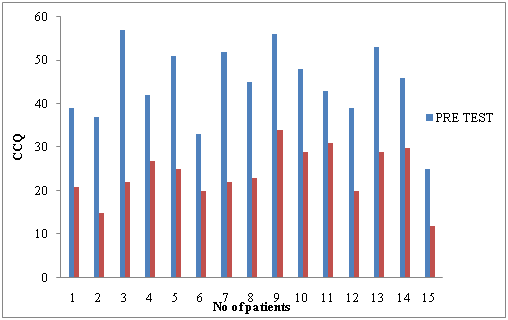 Using Clinical COPD Questionnaire (CCQ), in Group A there is maximum improvement in 1 patients, moderate improvement in 5 patients and minimum improvement in 3 patients. 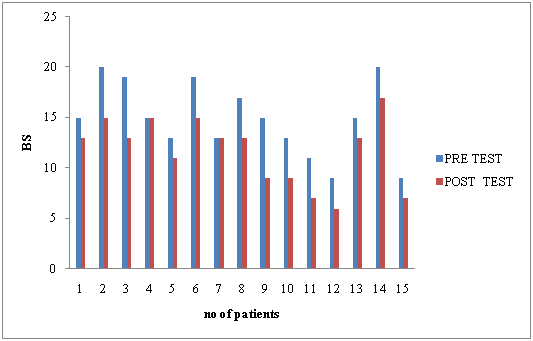 In Group B there is moderate improvement in 1 patient and minimum improvement in 4 patients. The ground walking and the relaxation techniques play an important role in dyspnea reduction and also reduces the anxiety and improves health status in patients with chronic obstructive pulmonary disease. Hence based on the information presented, the independent‘t’ test was performed to analyze the results. The calculated ‘T’ value for Borg’s scale 5.1278 and CCQ is 5.9153, which is greater than the table value of 2.048 in accordance to the level of significance of 0.05. Access Economics Pty Limited. Economic impact of COPD and cost effective solutions. The Australian Lung Foundation. 2008. Ayalu A. The study shows the reliability and validity of the clinical COPD questionnaire and chronic respiratory questionnaire. 2010. Aydin IO, Ulusahin A. Depression and anxiety, co morbidity and disability in tuberculosis and chronic obstructive pulmonary diseases. Gen Hosp Psychiatr. 2001;23(2):77–83. Bednarek M, Maciejewski J, Wozniak M, et al. prevalence, severity and under diagnosis of Chronic Obstructive Pulmonary Disease in the primary care setting. Respiratiry Medicine. 2008;4(3):103. Beeh KM, Watz H, Puente-Maestu L, et al. Aclidinium improves exerciseendurance, dyspnoea, lung hyperinflation, and physical activity in patients with COPD: a randomized, placebo-controlled, crossover trail. BMC Pulm Med. 2014. Berkhof FF, Metzemaekers L, Uil SM, et al. Health Status in patients with COPD and Heart failure: A validation and comparison between the clinical COPD questionnaire and the Minnesota living with heart failure questionnaire. Int J Chron Obstruct Pulmon Dis. 2014;9:999–1008. Eakin E G. The study conducted based on the measurement of dyspnoea using Borg Scale in chronic obstructive pulmonary disease. JSTOR. 1993;2(3):181–191. Global Initiative for Chronic Obstructive Pulmonary Disease (GOLD). Global strategy for the diagnosis, management, and prevention of Chronic Obstructive Pulmonary Disease. 2008. Gretchen A, Brenes. Anxiety and Chronic Obstructive Pulmonary Disease: Prevalence, Impact, and Treatment. 2003. He M. Efficiency and safety of pulmonary rehabilitation in acute exacerbation of chronic obstructive pulmonary disease. Med Sci Monit. 2015;21:806–812. Kendrick KR, Baxi SC, Smith RM. The study shows that usefulness of the modified 0–10 Borg Scale in assessing the degree of dyspnea in patients with COPD and Asthma. J Emerg Nurs. 2000;26(3):216–222. Maltais F, LeBlanc P, Simard C, et al. skeletal muscle adaptation to endurance training in patients with Chronic Obstructive Pulmonary Disease. Am J Respir Crit Care Med. 1996;154(2 Pt 1):442–447. Ställberg B, Nokela M, Ehrs PO, et al. 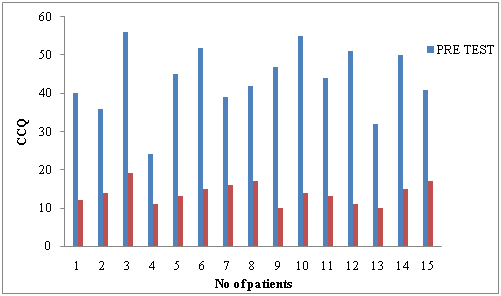 Validation of clinical COPD questionnaire (CCQ) in primary care. Health Qual Life Outcomes. 2009;7:26. Renfroe KL. Effect of progressive relaxation on dyspnoea and state of anxiety in patients with Chronic Obstructive Pulmonary Disease. Heart Lung. 1988;17(4):408–413. Revill SM, Morgan MD, Singh SJ, et al. The endurance shuttle walk: a new field test for the assessment of endurance capacity in Chronic Obstructive Pulmonary Disease. Thorax. 1999;54(3):213–222. Singh SJ, Morgan MD, Scott S, et al. Development of a shuttle walking test of disability in patients with Chronic Obstructive Pulmonary Disease. Thorax. 1992;47(12):1019–1024. S Watts, ZMckeough, S Jenkins, et al. Effects of ground walking training in Chronic Obstructive Pulmonary Disease: A Randomised Trial Control. 2008. Troosters T, Gosselink R, Decramer M. Six minute walking distance in healthy elderly subjects. European Respiratory Journal. 1999;14(2):270–274. ©2018 Muthukumar et al. This is an open access article distributed under the terms of the Creative Commons Attribution License , which permits unrestricted use, distribution, and build upon your work non-commercially.